What is Drake Tax Software? Drake Tax is a professional tax management suite designed for small to medium-sized accounting firms. It is one of the products from Drake Software which is a tax software solution. Drake Tax aims to help tax professionals prepare and process returns quickly and efficiently so they will be to focus more on working with their clients and building their business. Furthermore, Drake Tax speeds up the process of preparing returns through the aid of its shortcut keys and macros, reducing keystrokes and simplifying data entry. The software can also automatically calculate returns as users enter data. In addition, Drake Tax has the capability to export K-1 tax information to Form 1040, as well as, export 8615 parent’s tax information to a child’s Form 8615. Users can prepare multiple-state returns and print taxpayer forms in Spanish. The software also allows users to analyze multiple tax years, comparing taxes from year to year. If there are errors in the calculation of returns, users can quickly identify and correct them. Last but not the least, the software allows them to e-file federal and state returns. One of the interesting features offered by Drake Tax is that it enables users to quickly review the returns they are preparing and e-filing. After they calculate the return, the software displays the results of the calculation. Thus, they will be able to determine if the return is eligible for e-filing. Also, the software shows the fees and the refund amount in the calculation results. Moreover, users can quickly identify if there are some errors in the calculation of returns. This is because Drake Tax displays error messages after they calculate returns. These error messages provide information on how they can correct the errors to prevent issues that can result in an IRS rejection. They can also add notes for tax forms and returns that serve as reminders for themselves, or they can use these notes to share important information with their staff. In addition, Drake Tax provides users with the capability to import tax forms to the software. These forms include Forms W-2, K-1, and 1040. They can import Forms W-2 and K-1 using a 2D barcode scanner, a hardware that they have the option to integrate with the software. Aside from importing tax forms, the software enables them to export tax information to tax forms. As an example, they will be able to export K-1 tax information from 1041, 1120S, and 1065 returns to Form 1040. Drake Tax also has an e-filing feature that allows users to submit tax returns online. In e-filing returns, they can attach PDF documents to returns. To eliminate paper versions of returns, Drake Tax provides them with the option to use a signature pad that enables their customers to electronically sign returns. Additionally, the software uses PIN and consent screens that are built so customers can easily approve the returns. This e-filing feature also enables users to e-file state and federal returns separately or combine them together. If you are interested in Drake Tax Software it could also be sensible to investigate other subcategories of Best Tax Software listed in our database of B2B software reviews. There are well-liked and widely used solutions in each software group. But are they necessarily the best fit for your company’s specific wants? A trendy software product may have thousands of subscribers, but does it offer what you require? For this reason, do not blindly invest in popular systems. 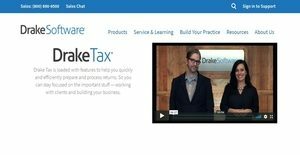 Read at least a few Drake Tax Software reviews and consider the factors that you desire in the software such as the fees, main functionality, available integrations etc. Then, choose a few systems that fit your wants. Try out the free trials of these platforms, read online reviews, get explanations from the seller, and do your homework systematically. This profound groundwork is certain to help you find the finest software solution for your organization’s unique requirements. How Much Does Drake Tax Software Cost? We realize that when you make a decision to buy Tax Software it’s important not only to see how experts evaluate it in their reviews, but also to find out if the real people and companies that buy it are actually satisfied with the product. That’s why we’ve created our behavior-based Customer Satisfaction Algorithm™ that gathers customer reviews, comments and Drake Tax Software reviews across a wide range of social media sites. The data is then presented in an easy to digest form showing how many people had positive and negative experience with Drake Tax Software. With that information at hand you should be equipped to make an informed buying decision that you won’t regret. What are Drake Tax Software pricing details? What integrations are available for Drake Tax Software? If you need more information about Drake Tax Software or you simply have a question let us know what you need and we’ll forward your request directly to the vendor.